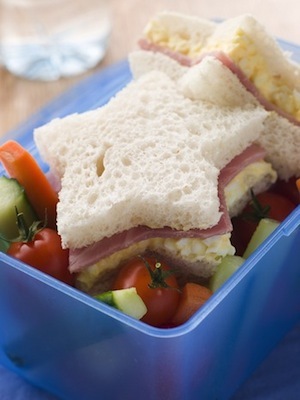 Need new kids sandwich ideas for packing lunch or eating at home? Spread the salad dressing on one side of each slice of toasted bread. Lay 3 slices of bacon onto each of 4 slices of bread. Top the bacon with 2 slices of ham. Add 2 slices of tomato to each sandwich and top with 2 spinach leaves. 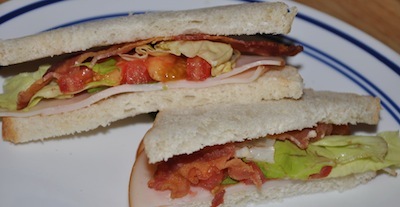 Place the other slices of bread, salad dressing down onto the top of each sandwich. Cut up bananas into coin slices and add to a peanut butter sandwich. Very healthy and simple for school lunches. Place the cream cheese into a mixing bowl. Add the crushed pineapple and stir until smooth. Spread the cream cheese mixture over the bottom half of the bagel. Place a pineapple ring onto each bagel half. Top with the remaining bagel half. Put cucumber on bread and serve. We Mom's know it's hard getting our kids to eat their veggie's, so to get mine to eat a little more (than SHE thinks! ), whenever she has a deli meat and cheese sandwich for lunch, I add grated carrots in between the meat and cheese... more veggie's for her, less hassle for me to get her to eat them! It's a win-win!! Spread peanut butter on both slices of bread. Place sliced banana's on either side of bread and sprinkle chopped walnuts on top of peanut butter. Drizzle honey across the walnuts. Put the bread and peanut butter together with the other half and enjoy! Cover one side of each slice of bread with the butter. Cut the bologna and salami slices in half. Place a half slice of bologna on each slice of bread and top with a slice of salami. Repeat with the bologna and salami slices. Top each club with sauerkraut. Spread the cheese evenly over each sandwich. Place the sandwiches on a microwave safe plate. Microwave the sandwiches on high 3 minutes. Turn the plate 1/2 turn and continue to microwave for 4 minutes or until heated through. Make the sandwich on the plate. Put the toast on the plate. Put cheese on hot toast. Put ham in the middle. Put the avocado insides into a bowl, add the lemon juice, drop Tabasco, and dash of salt, and mash until smooth and spreadable. Cut the baguette in half lengthwise and spread avocado mixture on both inside halves of bread. 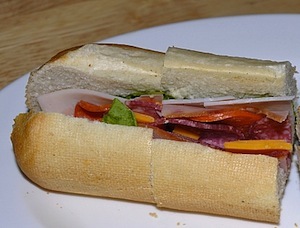 Arrange the sandwich ingredients evenly over one half of the baguette, then top with other half. You can wrap this as is to transport to picnic. Just bring a large serrated knife to cut into serving size. 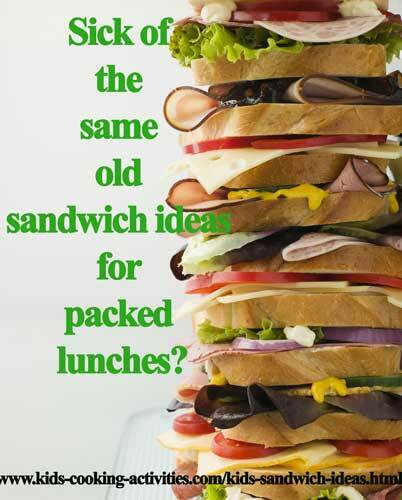 Or, cut ahead of time and wrap each sandwich serving individually. Spread the butter on one side of each piece of bread. Place one slice of bread in a small skillet over medium heat. Add the slice of Cheddar cheese. Place the bacon on top of the Cheddar cheese. Lay the bell pepper slices over the bacon. Add the slice of Swiss cheese over the pepper slices. Place the second piece of bread, butter side up on the top. Grill for 3 minutes, turn and continue grilling an additional 3 minutes or until browned and the cheese has begun to melt. by Pam (Louisiana) These are quick & easy to make with things in your kitchen. If anyone thinks they don't like Spam~~give this a try & don't tell anyone what is in it~until after they try it. Or if you prefer~~keep it your little secret! They will love it! 1. Place eggs in a pot. Add cool tap water to cover eggs & boil gently to cook. 2. Grate Spam & place in medium size bowl. 3. When eggs are done, rinse under cool water & peel eggs. Then Mash eggs with Potato Masher. Add to grated Spam. 4. Combine eggs, spam & relish. Then add Mayonnaise to combine. May use more Mayonnaise to your liking. 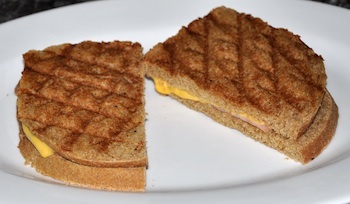 Then spread on bread slices to make sandwiches. 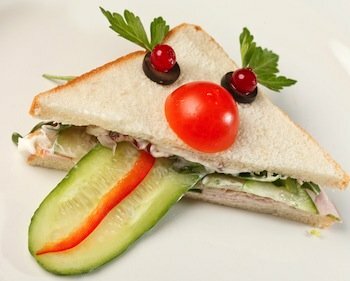 Sandwiches may be left whole or cut in half diagonally or into 4 little squares~~which are fun for kids to eat. Spread the sour cream ranch dip onto the cut sides of the bread. Layer the carrots, lettuce, cucumbers, all 4 types of meat and the cheese onto one side of the cut bread. Close the bread over the top. Wrap tightly in saran wrap and refrigerate for up to 8 hours. To serve, cut into 8 slices and secure with a toothpick. Spread pizza sauce on slice of bread add pepperoni cover with cheese. Spread light coat of reduced fat margarine on outside of sandwich. Have an adult to heat grill until hot. Then grill pizzawich on both sides until browned. Put 2 pieces of bread into the toaster. Then put a tiny bit of vegetable oil into a pan. Then crack an egg into the pan. Next cook it for 2-4 minutes. Cook ham in the same pan for 2 minutes. Take the bread out of the toaster. Put the egg, ham and lay American cheese on top. Place on your toasted bread. 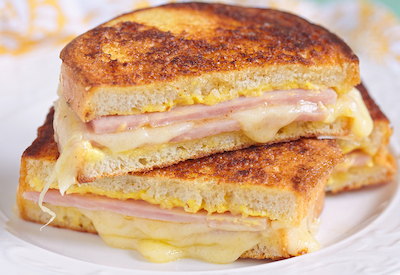 There is your ham, egg, cheese sandwich. Mix the Nutela and honey together. Spread on bread. Stick the 2 slices of bread together. 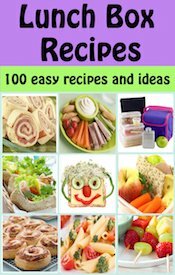 Find tuna sandwich recipes here as well. 1. Roll a slice of whole grain bread very thin with rolling pin. 3. Spread with topping (favs here are pb and j or cream cheese and diced or shredded veggies. 4. Roll up and put in fridge about 1/2 hr. See how to make this Monte Cristo here. Mix together the peanut butter,jam or jelly,marshmallow cream, and mini chocolate chips.Put 1 half of a TBS of butter on 1 slice of bread and 1 half of a TBS of butter on another slice of bread. Put 1 half of the mixture on a slice of bread that was not buttered and the other half of the mixture on the other slice of bread that was not buttered. Put together 1 slice of bread with butter and 1 slice of bread with the mixture, and do the same with the other 2 slices of bread. Heat a large skillet over medium heat. Melt butter in the skillet.Put the sandwiches in the skillet.Cook each side of the sandwiches for 2 minutes. Remove the sandwiches from the heat. Place 1 on one plate and 1 on another plate. Cut each one in half. Cut bread with cookie cutters, spread cream cheese or butter on the top. 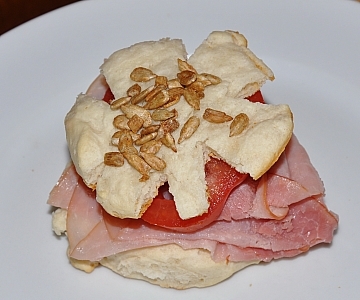 Top with cucumber slices, tomato slices, ham or other meat. Wrap in plastic wrap or place in small tupperware container. If kids are worried that their bread will get too "soggy," place cream cheese in small container and include a spreading knife. Let them assemble their sandwich at lunchtime. Using Cookie cutters for your sandwiches can add a little more fun for kids too! 2 Tablespoons of peanut butter,depending on how much you like. 1. Spread Peanut Butter on one side of each piece of bread. 2. Spread the Jelly on top of Peanut Butter. 3. Butter the other side of each piece of bread. 4. 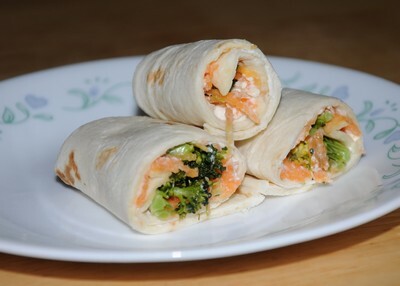 Put sandwich in frying pan and cook on each side for about two minutes,(depending on the frying pan). 5. Eat it and enjoy!!!!! Melt the butter on medium high on a small skillet big enough to put the slices of bread on. Take one slice of bread and place it flat on the skillet. Let it sit for a few minutes or until the bread is golden brown. Put the tomato, onion, and turkey on the bread. Then, add the other piece of bread and carefully try to flip over the sandwich over so that the new bread is on the skillet. Let stand for a few minutes and take the sandwich off the skillet and put on the plate. Add the Brussels sprouts to the sandwich. This will add a nutty flavor to the sandwich. You could add some honey mustard to the sandwich if you like. Once you have finished these steps, your ready to enjoy your sandwich! Cut a flower shape (using a cookie cutter) out of 2 slices of whole wheat bread. Spread peanut butter and jelly on one slice of bread. In the center of the second slice of bread, use a lid from a water bottle and cut out a small circle. It will resemble the center of your flower. Spread the cheese evenly over one side of the roast beef slices. Lay 3 pickles along the short side of each piece of roast beef. Roll the roast beef around up around the pickles. 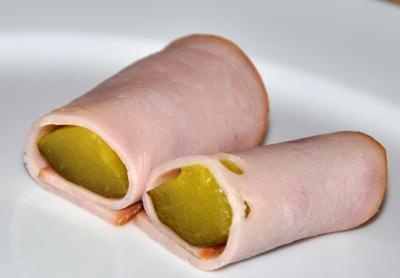 Place a toothpick into the middle of each pickle in each roll. Cut the rolls into 3 pieces each. 1. Place a piece of waxed paper on counter or table. Spread the tortillas out on waxed paper. Spread dressing over tortillas with a table knife. Place a lettuce leaf on each tortilla. Arrange meat on each tortilla near one edge. Top meat with cheese. 2. If using the apple, put it on a cutting board.l Use a sharp knife to cut the apple into 4 pieces. Cut out the core and cut the apple into thin slices. Arrange apple slices on top of the cheese. 3. Roll up tortillas, starting from the edge nearest the filling. Use the serrated knife to cut each tortilla roll in half crosswise. In a large lettuce leaf, layer deli meat, chicken salad, tuna salad, egg salad, chicken strips or chopped vegetables. Whatever filling you like. Add mustard or other dressing if you'd like. Roll up and eat. This is a good way to forgo the bread and save calories and add more nutrition. To create your lettuce wrap start with pesto and salsa. Whichever you like on your sandwich. Top with sprouts, meat and vegetables. Wrap up and enjoy! up. Wrap in plastic wrap and place in lunch box. ~Use whatever vegetables your kids like, just cut them in very small pieces. 1. Cut the crust off each slice of bread. 2. Use a rolling pin and roll each slice of bread to about 1/4 inch thickness. 3. Divide the ham between the 8 slices of bread. 4. Place a stick of string cheese on each slice of bread at the edge closest too you. 5. 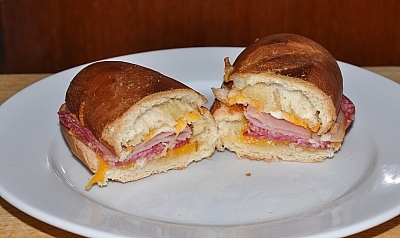 Roll the bread over the cheese and ham. 6. Place 4 toothpicks into the roll about 1 inch apart. 7. Using a serrated knife cut each roll into 4 sections. 8. Serve with the honey mustard for dipping. Cut the crusts of the bread and lay them out in a row on plastic wrap with about 3cm overlapping. Spread honey on the bread and then spread cottage cheese on top of it. Cut the fruit into thin slices so that you will be able to lay them out on the bread afterward. Lay the fruit on the bread in rows with space between each row. Finally, roll up the bread slices(together)and tightly wrap the wax paper around it. Leave it for about a minute and then cut the roll into slices (make about 3 slices). Now, all you have to do is pack it into your picnic basket and ENJOY! Spread Nutella or Peanut Butter on the tortilla. Roll up the tortilla around the banana. Mix together cream cheese and jam until well blended. 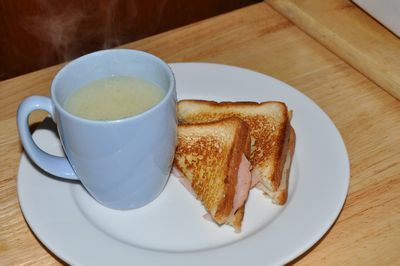 Spread cream cheese over slice of deli ham. 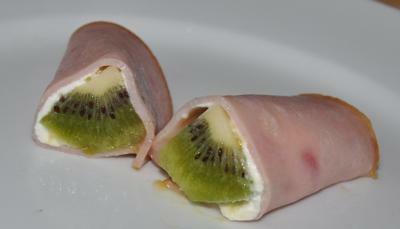 Top with a sliced kiwi and roll up. Enjoy! What are some of your Kid Sandwich Ideas?